According to a “canonical” view, reactive oxygen species (ROS) positively contribute, in different ways, to carcinogenesis and to malignant progression of tumor cells: they drive genomic damage and genetic instability, transduce, as signaling intermediates, mitogenic and survival inputs by growth factor receptors and adhesion molecules, promote cell motility and shape the tumor microenvironment by inducing inflammation/repair and angiogenesis. Chemopreventive and tumor-inhibitory effects of endogenous, diet-derived or supplemented antioxidants largely support this notion. However, emerging lines of evidence indicates that tumor cells also need to defend themselves from oxidative damage in order to survive and successfully spread at distance. 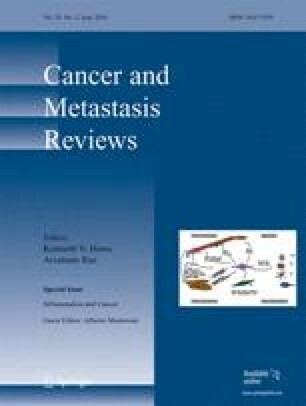 This “heresy” has recently received important impulse from studies on the role of antioxidant capacity in cancer stem cells self-renewal and resistance to therapy; additionally, the transforming activity of some oncogenes has been unexpectedly linked to their capacity to maintain elevated intracellular levels of reduced glutathione (GSH), the principal redox buffer. These studies underline the importance of cellular antioxidant capacity in metastasis, as the result of a complex cell program involving enhanced motility and a profound change in energy metabolism. The glycolytic switch (Warburg effect) observed in malignant tissues is triggered by mitochondrial oxidative damage and/or activation of redox-sensitive transcription factors, and results in an increase of cell resistance to oxidants. On the other hand, cytoskeleton rearrangement underlying cell motile and tumor-aggressive behavior use ROS as intermediates and are therefore facilitated by oxidative stress. Along this line of speculation, we suggest that metastasis represents an integrated strategy for cancer cells to avoid oxidative damage and escape excess ROS in the primary tumor site, explaning why redox signaling pathways are often up-regulated in malignancy and metastasis. The authors wish to thank Prof. Lido Calorini, as like as members of their laboratories for suggestions and insightful discussions. Authors are supported by the Italian Association for Cancer Research (AIRC) (grant# IG 8634 to G.P. and grant # IG8797 to P.C. ), by Istituto Toscano Tumori and Regione Toscana (TRESOR grants and PorCreo grant to P. C.).